The weeks seems to be whizzing past and I am enjoying my vegan life so far! If you read my last blog post (‘When you don’t want to do yoga’) you will know that I have really got back into my yoga and have begun to breath new life into my passion by attending new classes and starting a daily morning Ashtanga yoga practice at home. This practice really helps me to stay grounded and calm in my world that just gets busier and busier. This week I attended a Mindfulness in Schools course which was very insightful in ways to develop mindfulness both for staff and children. This is something I am very passionate about and am looking forward to being a driving force behind this project. Lunchtime came and a beautiful spread was laid out for us. When I asked the chef what the lovely sauces were for the rice or potato she said that EVERYTHING was gluten free and vegan to accommodate all of the dietary requirements. I was so amazed, the food was delicious and couldn’t thank the chef enough. She even made from scratch a sesame seed and peanut butter sauce which was incredible! This week I decided to get back into juicing once again. I had been having smoothies everyday but wanted something that wasn’t heavy on my stomach before attending a yoga class in the morning. When we visited a vegan cafe while on holiday in Gran Canaria called Zoe Food. There I had a delicious juice recommended to me and so I decided to have a go at replicating it. Each time I have this juice I try to add a little more ginger as it is so good for you, but I find it too spicy to drink. I am slowly getting used to it. I also made this juice which was mainly carrots, apple and ginger as I ran out of beetroot! A Pea & Kale sauce which tasted delicious on a sweet potato jacket! I love keeping this quite simple as then I know it will go with most meals as it is just quinoa and veg. I got the recipe from a brilliant blog called ‘Thoughtful Forkfuls‘. Alice is a Vegan chef who works at the yoga studio I go to. She has lots of tasty recipes on her blog I like to follow. These were easy to make and were mostly ingredients blended up and then squashed into a baking tray and cooked in the oven! These were great to heat up and have over the week with a salad or quinoa! I made my favourite meal again which was homemade vegan fajitas. I made everything from scratch except the wraps. A great Friday night post-yoga teaching treat!! On Saturday my boyfriend and I headed to London for a spontaneous day out there. We did not book anything to do such as a museum or show, so I decided to pay a visit to all my favourite vegan friendly spots! The first thing we did was head to Covent Garden to pay a visit to the Wild Food Cafe, my most favourite restaurant ever! 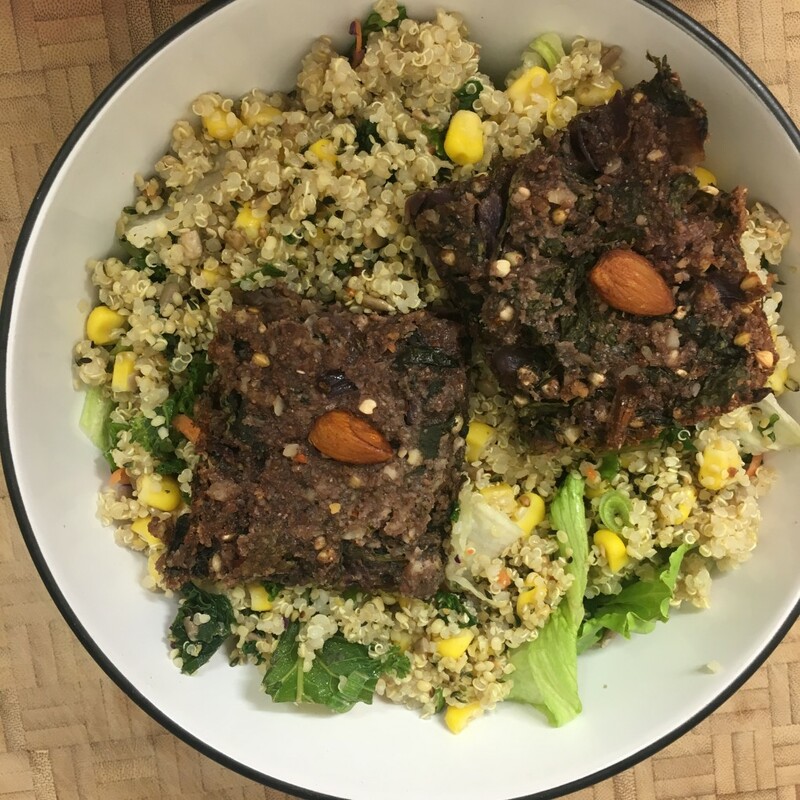 I have written a blog post all about this restaurant (Healthy Places to Eat in London – Wild Food Cafe) so won’t go into too much detail here about it, but it is all 100% vegan and mostly raw food which means I can choose ANYTHING on the menu! We both had a burger called ‘The Greatest Burger of All Time‘ – it really is! All of this meal is considered ‘raw’ due to the temperature it is cooked at. It was very tasty and tasted just like a normal cupcake! So overall it has been a busy week full of vegan surprises and delights! I find that it is much easier to be a vegan in a busy place like London where you have access to all these lovely shops and restaurants, but living a simple vegan life with access to quinoa, dried beans and lots of fruits and veggies suits me just fine. It is always a nice treat to visit these wonderful places when I do visit London. I have learnt this week that people can surprise you and be very accommodating to your vegan choice but you must always tell people in advance. Also, if you tell people in advance and they can’t help, then you can be prepared by bringing your own foods.